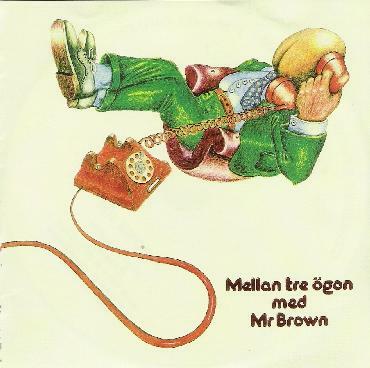 Mr. Brown - "Mellan tre ögon"
Although just seeing the light of day on CD for the first time, Swedish band Mr. Brown's debut (and only album) was originally released in 1977. Alas, it suffered the same fate as a number of other albums by progressive rock acts in the late 70's... it became lost in the tidal waves of punk rock and disco that were crashing through the music world at the time. Influenced by bands such as Genesis and Focus (though sounding to my ears a bit more like Camel and Nektar), Mr. Brown was a six-piece band that wove a tapestry of acoustic and electric guitars, percussion, Hammond organ, grand piano, and flute in the symphonic style. The band focuses on melody and arrangement, rather than on virtuoso chops, but the playing is certainly competent. The lead instrument that tends to dominate most of the songs is the grand piano (indeed, on one track, Resan till Ixtlan, it is the only instrument), though there is certainly some lovely guitar work too, especially on the 7-mintue Liv I Stad Utan Liv. Most of the album is fairly mellow, and despite the fact that it didn't fit in with the then current trends of punk and disco, some of the shorter songs on the album, such as the lovely Universe would have certainly fit into the breezy, spacey pop rock of the era. But other tracks, like the almost 10-minute Recall the Future and the upbeat Kharma '74, with their instrumental twists and turns, definitely belonged to a slightly earlier era of progressive rock. I wouldn't call Mellan tre ögan exactly a lost classic of progressive rock, but it is certainly a good listen, and for those interested, an intriguing look into the early roots of the current progressive rock boom in Sweden. For more information you can visit the Transubstans web site at: http://www.recordheaven.net.